The Artist series puts the essence of true musical collaboration in the hands of players and fans, with instruments that bear the names of the world’s most influential guitarists and bassists. Johnny Marr is best known as the strikingly dynamic guitarist-arranger-songwriter behind the Smiths, who redefined and ruled U.K. pop in the 1980s. A master of melody, layering and texture, Marr has brought his own instantly identifiable genius to the proceedings ever since, in stints with The The, the Pretenders Modest Mouse and the Cribs - to say nothing of his solo career and innumerable guest appearances. 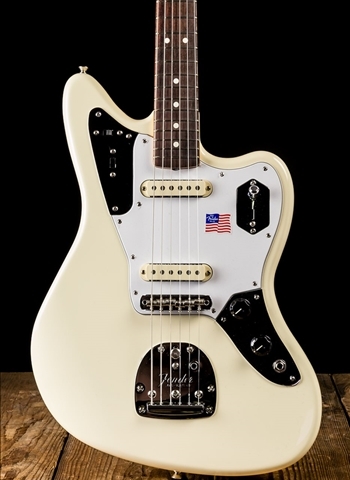 The Johnny Marr Jaguar is a fantastically non-standard model that is as distinctive as the sounds he wrings from it.